Xbox is a video gaming brand created and owned by Microsoft. It represents a series of video game consoles developed by Microsoft, with three consoles released in the sixth, seventh, and eighth generations, respectively. The brand also represents applications (games), streaming services, an online service by the name of Xbox Live, and the development arm by the name of Xbox Game Studios. The brand was first introduced in the United States in November 2001, with the launch of the original Xbox console. The original device was the first video game console offered by an American company after the Atari Jaguar stopped sales in 1996. It reached over 24 million units sold as of May 2006. Microsoft's second console, the Xbox 360, was released in 2005 and has sold 84 million units as of June 2014. The Xbox One has been released in 21 markets in total, with a Chinese release in September 2014. The head of Xbox is Phil Spencer, who succeeded former head Marc Whitten in late March 2014. The Xbox One was released on November 22, 2013, in North America, as the successor of the Xbox 360. The Xbox One competes with Sony's PlayStation 4 and Nintendo's Wii U and Switch as part of the eighth generation of video game consoles. Announced on May 21, 2013, the Xbox One has an emphasis on internet-based features, including the ability to record and stream gameplay, and the ability to integrate with a set-top box to watch cable or satellite TV through the console with an enhanced guide interface and Kinect-based voice control. On June 13, 2016, Microsoft announced the Xbox One S, a slimmer version of the Xbox One, at E3 2016. Phil Spencer, head of Xbox, announced Project Scorpio at E3 2016 on June 13, 2016, an addition to the Xbox One family, saying it would release in Holiday 2017. At E3 2017, Microsoft revealed the final name of the console to be Xbox One X, and that it would start shipping worldwide on November 7, 2017 for a final retail price of $499. 733 MHz x86 Intel Celeron/Pentium III Custom Hybrid CPU 3.2 GHz IBM PowerPC tri-core CPU codenamed "Xenon" 1.75 GHz AMD x86-64 eight-core CPU codenamed "Jaguar" 2.3 GHz semi-custom AMD x86-64 eight-core CPU code named "Jaguar Enhanced"
4K 2160p (Xbox One S), 1080p, 720p, Xbox One does not support any interlaced resolutions. Via Softmods and/or modchips; Modified Windows CE 2.x, Linux. Development on PC with XNA Game Studio ($99/year subscription, binary distribution with XNA 1.0 Refresh). ID@Xbox and approved Microsoft Store; UWP apps. Xbox SmartGlass is a companion application for Xbox 360 available for Windows 8, Windows 10, Windows Phone, iOS, Android (version 4.0 and above), and Windows Server 2012. It was announced by Microsoft during E3 2012 and released on October 26, 2012, coinciding with the release of Windows 8. It connects with the Xbox 360 and allows more interactive entertainment, allowing mobile devices to potentially serve as second screens and remote controller. Currently[when?] Windows 8 and Windows RT Tablets and PCs, Windows Phone (7.5 and 8) iOS devices, and Android smartphones (4.x) are compatible with SmartGlass, providing information such as Halo 4 stats and Forza Horizon GPS. Users of Windows Server 2012 can currently download the application from the Windows Store after installing the Windows Desktop Experience feature in the Server Manager. Gaming Cloud is a division within Microsoft's Xbox team to help game developers incorporate their cloud computing elements, such as Microsoft Azure within their games. While focused on Xbox and Windows games, the division will support developers regardless of target platform or distribution channel. The division was formed in March 2018, and led by Kareem Choudhry. In 2016, Microsoft announced that it would hold its own Xbox FanFest instead of a press conference at the Gamescom annual European video game convention. Microsoft held an Xbox FanFest in Sydney in September 2016. ^ a b "Gamers Catch Their Breath as Xbox 360 and Xbox Live Reinvent Next-Generation Gaming". Microsoft. May 10, 2006. Archived from the original on June 21, 2008. Retrieved March 30, 2009. ^ Gilbert, Ben (April 10, 2014). "Getting to know Microsoft's new Xbox lead, Phil Spencer". Engadget. Retrieved May 9, 2014. ^ "Satya Nadella email to employees on tuning our organization". Microsoft. March 31, 2014. Retrieved April 6, 2014. ^ Karmali, Luke (July 6, 2013). "Rejected Names for the Original Xbox Revealed". IGN. Ziff Davis. ^ "Xbox Live's Major Nelson » Xbox LIVE being discontinued for Original Xbox consoles and games :". Majornelson.com. April 15, 2010. Retrieved April 22, 2013. ^ "Earnings Release FY13 Q1". Microsoft. Retrieved October 18, 2012. ^ "Xbox 360 Launch Takes Europe by Storm". Archived from the original on June 3, 2012. ^ "New Xbox 360 Shipping Today, Costs $299". Kotaku.com. June 14, 2010. Retrieved November 11, 2010. ^ Thorsen, Tor (June 14, 2010). "New $200 Xbox 360 planned, Elite & Arcade getting $50 price cut". GameSpot. CBS Interactive. Archived from the original on August 26, 2011. Retrieved June 17, 2010. Moore said that Microsoft is currently working on a second new Xbox 360, which will be offered at the arcade's price point of $200. He declined to say what functionalities the cheaper model would or would not have. […] One likely scenario is the cheaper model will essentially be a slim arcade with no Wi-Fi capabilities or a hard drive. 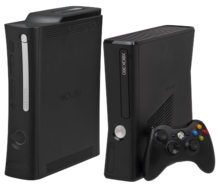 […] Moore also said that going forward, all future models of the Xbox 360 would not have names and would only be designated by their memory capacity. ^ "Microsoft unveils Xbox One next-generation console". BBC News. May 21, 2013. Retrieved May 21, 2013. ^ "Xbox One adds Smart Match, Game DVR". Gamespot. May 21, 2013. Archived from the original on June 8, 2013. Retrieved May 21, 2013. ^ "Why Microsoft's Xbox One Won't Kick the Cable Guy Out of Your House". AllThingsD. May 22, 2013. Retrieved May 22, 2013. ^ Jeffrey Grubb (May 21, 2013). "Deal with it: Xbox One requires an Internet connection". VentureBeat. Retrieved June 7, 2013. ^ "How Games Licensing Works on Xbox One". Microsoft. Retrieved June 6, 2013. ^ Stuart, Keith (June 19, 2013). "Xbox One: Microsoft abandons controversial DRM restrictions". The Guardian. Retrieved June 19, 2013. ^ "Kinect on Xbox One will not record or upload your conversations, Microsoft says". Polygon. Retrieved June 10, 2013. ^ Kinect No Longer Mandatory For Xbox One (But Will Still Come With It) [UPDATE]. Kotaku.com. Retrieved on August 23, 2013. ^ "Xbox One no longer requires Kinect, but it'll still come in the box, and you'll still pay $500". ExtremeTech. Retrieved September 5, 2013. ^ Webster, Andrew (June 13, 2016). "Microsoft announces the Xbox One S, its smallest Xbox yet". The Verge. Retrieved June 13, 2016. ^ Webster, Andrew (June 13, 2016). "Project Scorpio is a 4K-capable, VR-ready Xbox One launching next fall". The Verge. Retrieved June 13, 2016. ^ Warren, Tom (June 11, 2017). "Xbox One X is Microsoft's next games console, arriving on November 7th for $499". The Verge. Retrieved June 12, 2017. ^ "Xbox One to Launch on November 22, 2013 in 13 Markets". Retrieved December 30, 2016. ^ "77 million Xbox 360s sold". Gamespot. Archived from the original on April 25, 2013. Retrieved April 24, 2013. ^ Morris, Chris (May 9, 2006). "Grand Theft Auto, Halo 3 headed to Xbox 360". CNN. Retrieved November 24, 2007. ^ a b Epstein, Zach (February 12, 2013). "MICROSOFT SAYS XBOX 360 SALES HAVE SURPASSED 76 MILLION UNITS, KINECT SALES TOP 24 MILLION". BGR.com. Retrieved February 15, 2013. ^ "Best-selling Xbox One games of all time". Windows Central. Retrieved June 12, 2017. ^ a b c "Xbox One review: Much improved, has hit its stride (updated for holiday 2015)". Retrieved December 30, 2016. ^ a b c "Xbox One X | Xbox". Xbox.com. Retrieved June 12, 2017. ^ Cunningham, Andrew (September 3, 2013). "Xbox One gets a CPU speed boost to go with its faster GPU". ArsTechnica. Retrieved November 26, 2013. ^ Tuttle, Will (June 11, 2017). "The Xbox E3 2017 Briefing: Everything You Need to Know". Xbox Wire. Retrieved June 12, 2017. ^ "CES: Microsoft Reveals Xbox 360 Sales To Date – IGN". IGN. January 10, 2012. Retrieved February 9, 2012. ^ "SmartGlass installation | Companion Application". Xbox.com. Archived from the original on August 17, 2012. Retrieved November 8, 2012. ^ "Xbox SmartGlass | Companion Application". Xbox.com. Archived from the original on October 20, 2012. Retrieved October 18, 2012. ^ "Xbox SmartGlass | Companion Application Xbox.com". Microsoft. Archived from the original on April 9, 2013. Retrieved March 18, 2013. ^ "Xbox SmartGlass". Xbox.com. October 22, 2012. Archived from the original on October 25, 2012. Retrieved October 24, 2012. ^ Bass, Dina (March 16, 2018). "Microsoft's Xbox Unit Seeks to Lure Game Makers to Cloud". Bloomberg Businessweek. Retrieved March 16, 2018. ^ Wawro, Alex (March 16, 2018). "Microsoft targets game devs with new 'device-agnostic' Gaming Cloud biz". Gamasutra. Retrieved March 16, 2018. ^ "Inside Xbox 360 Controller". 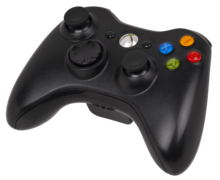 ^ "Xbox's original beast of a controller making a comeback?". CNET. June 15, 2005. Retrieved October 16, 2011. Anyone who purchased the original Xbox during its launch window quickly came to know its behemoth of a controller, now nicknamed "Duke." ^ ""Project Natal" 101". Microsoft. June 1, 2009. Archived from the original on January 21, 2012. Retrieved June 2, 2009. ^ "Starting February 1, 2012: Use the Power of Kinect for Windows to Change the World – Kinect for Windows Blog – Site Home – MSDN Blogs". Blogs.msdn.com. January 9, 2012. Retrieved March 12, 2012. ^ "Microsoft Xbox 360 Kinect Launches November 4". Gizmodo. ^ "Kinect gets UK release date". BBC. Retrieved August 17, 2010. It will hit the shelves on 10 November, five days after the US. ^ "Xbox 360s Kinect given release date for Australia". September 1, 2010. Retrieved September 3, 2010. ^ a b Boyd, Graeme (AceyBongos) (July 20, 2010). "Kinect bundled with slim 4 GB Xbox 360 Arcade for $300, new console for $200 in August". Twitter. Archived from the original on July 20, 2010. Retrieved July 20, 2010. Euro prices are 149.99 Euro for the camera + Kinect Adventures, 299.99 Euro for the 4 GB console bundle. ^ a b Purchese, Robert (September 8, 2010). "£300 Kinect 250 GB bundle confirmed". Eurogamer. Retrieved September 8, 2010. ^ Ingham, Tim (March 9, 2011). "Kinect cruises past 10 m sales barrier". CVG. Archived from the original on March 11, 2011. Retrieved March 10, 2011. ^ Orland, Kyle (February 21, 2011). "News – Microsoft Announces Windows Kinect SDK For Spring Release". Gamasutra. Retrieved March 16, 2011. ^ "Microsoft: "Kinect SDK Coming In March."". Gadgetsteria.com. February 21, 2011. Archived from the original on March 19, 2011. Retrieved March 16, 2011. ^ Knies, Rob (February 21, 2011). "Academics, Enthusiasts to Get Kinect SDK". Retrieved March 18, 2011. ^ "Microsoft releases Kinect for Windows SDK – latimes.com". Latimesblogs.latimes.com. June 16, 2011. Retrieved October 19, 2011. ^ "Xbox One Kinect: Only Peeping If You Want It To". All That Gaming Stuff. June 6, 2013. Retrieved June 6, 2013. ^ Lowensohn, Josh; Franklin, Eric (May 21, 2013). "Xbox One controller gets programmable trigger buttons, design refinements". CNET. Retrieved May 30, 2013. ^ Frank, Allegra (July 13, 2016). "Microsoft ditches Gamescom 2016 press conference for fan event". Retrieved December 30, 2016. ^ O'Brien, Lucy (September 6, 2016). "Xbox Fanfest Launching in Sydney". Retrieved December 30, 2016.